Argument: I would support a plan to build a restaurant in my neighborhood. Support 1: A restaurant would be very helpful catering for the needs of those who have long working hours and those who don’t work anywhere close to their houses. Support 2: Having a restaurant would provide a ready market for the farm produce. Support 3: A restaurant would definitely need workers like cleaners, waiters. and other employees. Thesis: A restaurant can greatly fuel the growth of my neighborhood and open it up to more investors who would aiming to tap the growing number of people. Eating out is a culture that dates back several hundred years. The habit increases with urbanization. People intowns and cines like restaurants because apart from providing an opportunity for a change in the way one dines, restaurants provide the convenience that they need. 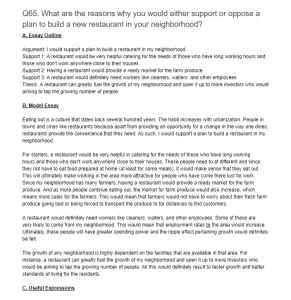 As such, I would support a plan to build a restaurant in my neighborhood. For starters, a restaurant would be very helpful in catering for the needs of those who have long working hours and those who don’t work anywhere close to their houses. These people need to at different and since they not have to eat food prepared at home (at least for some meals), it would make sense that they eat out. This will ultimately make working in the area more attractive for people who have come there lust for work. Since my neighborhood has many farmers, having a restaurant would provide a ready market for the farm produce. And as more people continue eating our, the market for farm produce would also increase, which means more sales for the farmers. This would mean that farmers would not have to worry about their fresh farm produce going bad or being forced to transport the produce to far distances to find customers. A restaurant would definitely need workers like cleaners, waiters, and other employees. Some of these are very likely to come from my neighborhood. This would mean that employment rates tn the area would increase. Ultimately, these people will have greater spending power and the ripple effect pertaining growth would definitely be felt. The growth of any neighborhood is highly dependent on the facilities that are available in that area. For instance, a restaurant can greatly fuel the growth of my neighborhood and open it up to more Investors who would be aiming to tap the growing number of people. All this would definitely result to faster growth and better standards of living for the residents.